• Panufnik: One Song or Three? Last month I spent a few days researching Panufnik manuscripts in Kraków’s Jagiellonian Library. I was interested mainly in his working versions of major pieces from the 1940s and 50s; I will write on these shortly. Another set of manuscripts also caught my eye. These were of three songs written for a competition celebrating the imminent formation in December 1948 of the Polish United Workers’ Party (PZPR). Although Panufnik professed in his autobiography to writing just one song, and that under duress, it has been known for a while, from other archives, that like five of his colleagues he wrote music to all three set texts. But the existence of these fair copies in his own hand has not been so well-known. I have written a short article exploring these manuscripts and their history. Leafing through Trybuna Robotnicza (Workers’ Tribune) – as one does – I came across an entry yesterday that brought me up sharp. Trybuna Robotnicza was the daily newspaper in Silesia of Poland’s United Workers’ Party PZPR between 1945 and 1990. Its pages in the late 1940s and early 50s are filled with the customary eulogies to Stalin, Lenin, Bierut, to peace, culture for the masses, etc.. I’ve been looking for musical items, of which there are precious few. Most of these centre on workers’ ensembles, opera and ballet, and most of all on the Silesian Philharmonic. Occasionally, national musical items appear, and I suspect that this little column published on 27 April 1950 was syndicated from Warsaw, and it therefore may well have appeared elsewhere in the Polish press at that time. It’s a list of composers with pieces they have proposed, are still writing or have completed as Labour Day approaches. Top of the list is Andrzej Panufnik, with a work whose title is not only completely new to me but I suspect will be new to everyone else. Silesian Hammers is enough to make the mind boggle. What magnificent industrial heroism did Panufnik intend to evoke? It seems highly improbable that the score was ever begun, let alone completed, but one never knows. One possibility, which I have yet to explore fully, is that Silesian Hammers may have been an intermediate stage in the convoluted history of Panufnik’s Heroic Overture, which was first heard under this title at the end of 1950. Some of the other composers are familiar, although some of their pieces, like Silesian Hammers, may never have materialised. Numerous Polish composers, wanting to mark the approaching Labour Day, have undertaken to write or complete by the First of May a range of new mass songs, cantatas, symphonic pieces etc..
Andrzej Panufnik – has proposed an orchestral piece called Silesian Hammers. Grażyna Bacewicz undertook to complete a Suite of Polish Dances for symphony orchestra. She has fulfilled her compositional commitment ahead of schedule. Stanisław Skrowaczewski has completed a cantata called A Word about Stalin [this almost certainly became the Cantata about Peace (1951)]. Alfred Gradstein has proposed two youth songs. Stanisław Kazuro has undertaken to orchestrate his 128-page score of Polish Rhapsody. Jerzy Sokorski is composing a solo song called Song about the Coal Basin. Aleksander Wielhorski has proposed a youth song called Heroes of Labour. Apolinary Szeluto has finished his May Song to words by Orłow. Henryk Swolkień is writing for 1 May a song for solo, choir and orchestra to words by Tadeusz Kubiak. Stanisław Prószyński has committed to composing a song for ZSCh [Zwiążek Samopomocy Chłopskiej – Union of Peasant Self-Help] called Shared Harvest. Jan Krenz has proposed a cantata to a text by K. I. Gałczyński [Conversation of Two Cities (1950)]. Jerzy Młodziejowski is finishing a cantata called Hey, Hammers, To Work!. In addition, similar commitments for 1 May have been made by many other composers. Scarlett Panufnik vanished from public attention once she and Andrzej Panufnik divorced in 1958. Andrzej Panufnik was her fourth husband – they fell for one another in 1950 during her honeymoon with her third husband – and she was by all accounts vivacious, seductive and socially ambitious. Of Irish stock, she found herself in Poland after the Second World War and cut quite a figure in Warsaw during the years prior to her departure for London in March 1954. Scarlett and Andrzej Panufnik, London, 1956. Another shot from the same session provides the frontispiece for ‘Out of the City of Fear’. Panufnik did manage to join her in July 1954 and two years later she wrote an account of her time in Poland in the autobiographical Out of the City of Fear (1956). The book has a breathlessness bordering on the sensational, and it has its shortcomings and lacunae (one of which is failing to mention her second and third marriages). It soon disappeared from view – times had moved on. But its portrayal of life in post-war Poland does have socio-historical value, and much of it reads more convincingly than it has often been given credit for. This is especially true of the final four chapters. These constitute her diary of the four months that she spent alone in London while waiting on tenterhooks for her husband to find a way to leave Poland and seek asylum in the UK. Her part in preparing for his escape and keeping everything under wraps was invaluable. Panufnik acknowledged her role in his 1987 autobiography, Composing Myself, and it is through this prism that she has since been viewed. Two recent articles in Polish have broadened the perspective, even if some of their conclusions are debatable. Danuta Gwizdalanka’s ‘Ucieczka z państwa grozy‘ (Escape from the State of Terror), Ruch Muzyczny (23 August 2014), covers some of the same ground as my two articles on Panufnik’s escape but goes on to examine its aftermath. Magdalena Grochowska’s Przynęta i obroża Andrzeja Panufnika (Andrzej Panufnik. Bait and Collar), Gazeta Wyborcza (25 October 2014), takes an even more critical and well-referenced look at Panufnik in the post-war period. The final chapter of Out of the City of Fear covers the five days from 10-14 July 1954 once Scarlett Panufnik received a phone call from her husband to say that he had reached Zürich. If all went to plan, he would be in London in a few days’ time. I have based my article linked to this post, Panufnik’s Escape (2): Scarlett’s Memoir, on the relevant excerpts from Chapter 17 and set their chronology between that of the Polish Legation (1954) and Andrzej Panufnik’s account in his autobiography. The three versions make for interesting reading, even if they do raise more questions than they answer. In the annals of defections from the Polish People’s Republic in the 1950s, that of Andrzej Panufnik in July 1954 is one of the least likely. He was not a fighter pilot like Franciszek Jarecki or Zdzisław Jazwiński, who flew MiG jets to Denmark in March and May 1953. Nor was Panufnik a senior figure in Urząd Bezpieczeństwa (Poland’s Department of Security) like Lieutenant-General Józef Światło, who defected via the US military mission in West Berlin while on a visit to East Berlin in November 1953. Nor was Panufnik living abroad when he defected, unlike the writer Czesław Miłosz, who was the Polish Cultural Attaché in Paris when he decided to seek political asylum in France in 1951. There were some Polish composers who were living abroad, especially in France. One of these, Roman Palester, had left Poland a couple of years after the Second World War, when it was still possible to do so. He effectively emigrated fully in 1949, moving to Munich in 1952, where he worked for Radio Free Europe. Act-alone defectors such as these had a relatively immediate, if sometimes high-risk transition from communist Poland to the capitalist West. Panufnik’s escape, however, was prolonged (six days) and he was totally dependent on others for its successful outcome. In effect, he did not spring free; he was sprung. The best-known narrative of Panufnik’s flight from Warsaw to London via Zürich comes from his autobiography, Composing Myself, published 33 years later in 1987. His fear and nervousness are vividly recalled, but how accurate is his account? In the first of two related articles, posted today, I compare his story with an official one-page Polish memo written in Switzerland the day after Panufnik landed at Heathrow. Reproduced here for the first time is a letter dated 21 April 1950. It is from Andrzej Panufnik, who expresses his desire to write a Revolutionary Symphony. Not heard of this work before? That’s not surprising, because he never wrote it. Instead, the project transmuted itself into his Symphony of Peace (1951). 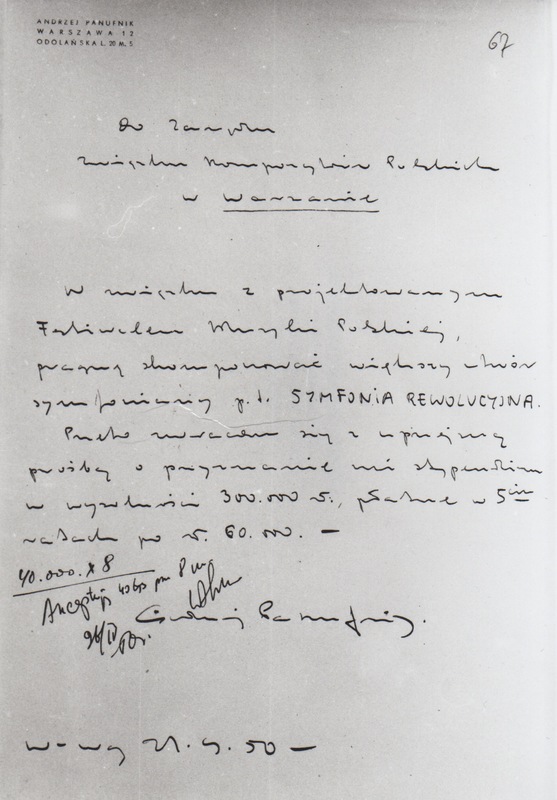 The source of this letter, and of letters from over 50 other Polish composers, is a file I stumbled across in a Polish archive, half a century after it was sent. I have written about Panufnik’s letter and Lutosławski’s before, and my article on this collection was published online by the Polish Music Center in Los Angeles in 2002. I have now republished it here – File 750: Composers, Politics and the Festival of Polish Music (1951) – alongside updated appendices. These letters from 1950 provide an insider’s view of how composers navigated the system of commissions and funding at the height of socialist realism, what they had already written that they deemed suitable, what they wanted to write, how they justified their proposals, how much they thought they were worth financially, and how much the Minister of Culture rated them. There are further research questions to be asked of this primary material, not least of which is the fact that the majority of the proposed compositions never materialised. Here, for starters, is my initial survey from 2002. A new collection of essays on post-war Polish music has just been published by Musica Iagellonica in Kraków. 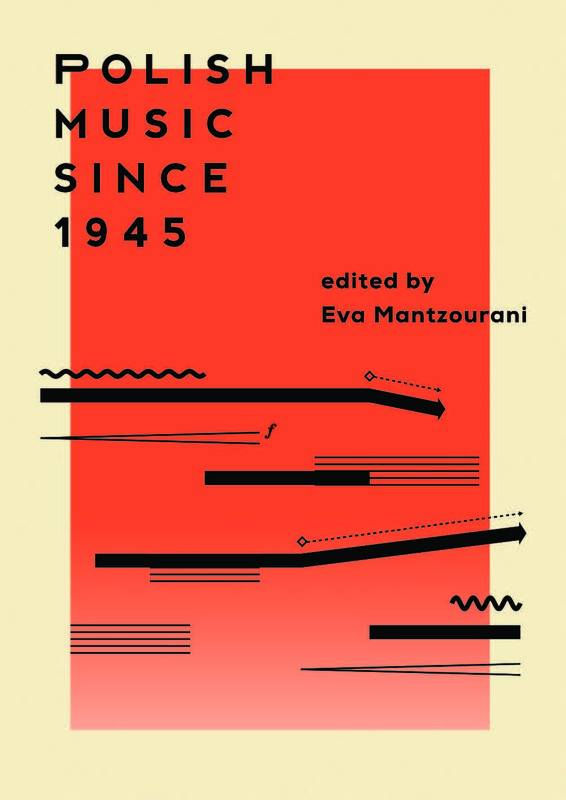 It is edited by Eva Mantzourani, who convened a conference four years ago, at the Canterbury Christ Church University in Kent, UK, under the title ‘Polish Music since 1945’. Scholars young and old came from far and wide, and this volume of 31 essays is the result of those very stimulating days in May 2009. It may be purchased at the Musica Iagellonica online shop for 85zł (c. £17/$27, plus postage). The list of contents is given below. • Iwona Lindstedt: ‘Sonoristics and serial thinking: On the distinctive features of works from the “Polish School”’. In 1951, Witold Lutosławski was a (no doubt reluctant) member of an official delegation from Poland to the Soviet Union, visiting Moscow, Rostov and Leningrad over the space of three weeks, all in the cause of ‘Polish-Russian Friendship’. Quite apart from his dismay at the blatantly political role of the visit, a large part of his reluctance to be part of this 22-strong group must have stemmed from his childhood memories of his father’s fate: Lutosławski saw him briefly in prison before both his father and his uncle were shot by Bolshevik forces in 1918 (see my earlier post: WL100/55: Death of Lutosławski’s father). Lutosławski subsequently reported on his visit for the Polish journal Muzyka 2 (November 1951, no.11 (20), pp.6-7). But his subject matter is remarkably distanced from standard politicised propaganda about the USSR. Even so, its unctuous tone is so exaggerated that one wonders who could have genuinely believed that Lutosławski’s heart was in it. Indeed, it is more than likely that it was edited by a political minder or even written by one and added to by Lutosławski. On the eve of my first visit to Moscow – to its Conservatoire, among other places – I thought of his account, written under considerably more duress than affects today’s visitors to Russia, who cannot be unaware, however, of its government’s perpetuation, even expansion of restrictions on personal freedoms and self-expression. This article is reprinted in Witold Lutosławski. O muzyce. Pisma i wypowiedzi, ed. Zbigniew Skowron (Warsaw, 2011, pp.365-7), but it is not included in the preceding English version Lutosławski on Music (Lanham MD, 2007). The translation here is my own. When one goes down into the Moscow metro for the first time, one succumbs to feelings of awe and admiration: we are in a palace. Marble, sculptures, mosaics, intricate chandeliers, wall lamps, all sparkling clean, all gleaming with light. Each glimpsed station delights the eye with its novelty, different from the one before. Like rooms in a grand residence, individual metro stations make up a precisely worked-out, artistic whole. The splendid Ploshchad Revolyutsii, filled with bronze figures, the modest Mayakovskaya, all graceful, finished steel curves, and much, much more. Gdy po raz pierwszy zejdziemy do metra moskiewskiego, ulegniemy uczuciom zdumienia i podziwu: jesteśmy w pałacu. Marmury, rzeźby, mozaiki, kunsztowne żyrandole, kinkiety, wszystko lśni czystością, jarzy się światłem. Każda ujrzana stacja raduje oczy swą nowością, niepodobna jest do poprzedniej. Jak sale w pysznej rezydencji, stacje metra stanowią – każda osobno – starannie wypracowaną, artystyczną całość. Wspaniała, wypełniona postaciami z brązu stacja Rewolucji, skromna, cała we wdzięcznych, stalą wykończonych łukach Majakowskaja i wiele, wiele innych. We are awed in that first moment. Our habits and memories from other European cities still make us associate the idea of an underground station with some sort of huge, dirty bathroom. Our amazement recedes, however, after a moment’s reflection. The metro is still a mechanism for millions of people, so what is odd about so much work and artistic finish being put into its construction? Is it not more amazing – in the negative sense of the word – that in recent times palaces have been built for the daily use of just one family? While works of art, these buildings are also evidence of unbounded self-centredness. In the Soviet Union, they are today admittedly converted into museums, accessible to every citizen, though they are not daily at anyone’s disposal. The only true palace built for millions of people is the Moscow metro. Every citizen in this capital of several million feels at home in this palace; not a day goes by when he does not spend a few moments in it and can rejoice at will in its splendour. Zdumiewamy się tym w pierwszym momencie. Przyzwyczajenia nasze i wspomnienia z innych miast Europy każą nam przecież kojarzyć pojęcia stacji kolei podziemnej z jakąś olbrzymią, brudnawą łazienką. Zdumienie nasze ustępuje jednak po chwili zastanowienia. Metro jest przecież urządzeniem dla milionów ludzi, cóż więc dziwnego, że w jego budowę włożono tu tyle pracy i artystycznego wykończenia? Czyż nie bardziej zdumiewającym – w ujemnym sensie tego słowa – jest fakt, że w minionych czasach budowano pałace, mające na co dzień służyć zaledwie jednej rodzinie? Będąc dziełami sztuki, były te budowle jednocześnie świadectwem bezgranicznego egocentryzmu. W Związku Radzieckim są dziś one wprawdzie zamienione na muzea, są dostępne każdemu obywatelowi, nikomu jednak na co dzień nie służą. Prawdziwym pałacem zbudowanym dla milionów ludzi jest dopiero metro moskiewskie. Każdy obywatel kilkumilionowej stolicy czuje się w tym pałacu u siebie, nie ma dnia, aby nie spędził w nim kilku chwil, może do woli radować się jego wspaniałością. The Moscow Conservatoire, named after Tchaikovsky, is an academy of great, universal traditions. Its founder was Anton Rubinstein, one of its professors Tchaikovsky. From the walls of this academy have come great artists, whose names belong to the first rank in the world. Today, the Moscow Conservatoire is the leading music academy in the Soviet Union. Young people from the many nations of the USSR are educated there. The great traditions are alive in every sense and year on year are enriched by new talents and new pedagogical achievements at the highest level. Konserwatorium moskiewskie imienia Czajkowskiego jest uczelnią o wielkich, światowych tradycjach. Założycielem jego był Antoni Rubinstein, jednym z profesorów – Czajkowski. Z murów tej uczelni wyszło wielu artystów, których nazwiska należą do pierwszych w świecie. Dziś konserwatorium moskiewskie jest przodującą uczelnią muzyczną Związku Radzieckiego. Kształci się w nim młodzież wielu narodów ZSRR. Wielkie tradycje żyją w całej pełni i są z roku na rok wzbogacane nowymi talentami i nowymi osiągnięciami pedagogicznymi na najwyższym poziomie. We were at the Conservatoire to become acquainted with the work of students in the composition class. For this unique opportunity we are indebted to the exceptional kindness of the director of the conservatoire, [Alexandra] Sveshnikova, as well as Professors [Yuri] Shaporin and [Anatoly] Bogatyrev, who at our request specially organised a little compositional event. With passionate interest we hear this improvised concert. Before us a group of students, composers and performers, representatives of various nationalities: besides the Russians there are also citizens of Georgia, Armenia, Kazakhstan and the Mari El Republic. Znaleźliśmy się w konserwatorium, aby zapoznać się z twórczością studentów klas kompozycji. Wyjątkową tę okazję mamy do zawdzięczenia niezwykłej uprzejmości dyrektora konserwatorium Swiesznikowa, jak również profesorów Szaporina i Bogatyriowa, którzy na naszą prośbę specjalnie zorganizowali małą produkcję kompozytorską. Z żarliwym zainteresowaniem słuchamy tego zaimprowizowanego koncertu. Przed nami grupa studentów, kompozytorów i wykonawców, przedstawicieli różnych narodowości: oprócz Rosjan są to obywatele Gruzji, Armenii, Kazachstanu, Republiki Maryjskiej. We will try to sketch the common features of the pieces being performed. The words that immediately suggest themselves are clarity of thought, simplicity and melodiousness. A lack of any excesses or technical displays. Compositional technique is used here as a means of expression. None of the young composers has given in to the temptation to show first and foremost what he knows. He always shows what he has to say. This displays great maturity, a developed sense of responsibility. Tremendous maturity is also met in the instrumental aspects of the works. Each of the compositions that we hear sounds instrumentally accurate and idiomatic, and not infrequently is a testament to real artistry in its field (e.g. the Piano Toccata by [Andrei] Eshpai or the Cello Suite by [Sulkhan] Tsintsadze). The performing side of the event we heard was of the highest level. Some students are fully mature, first-rate artists. Among them, a star of the first magnitude: the cellist [Daniil] Shafran. Spróbujemy naszkicować wspólne cechy wykonanych utworów. Słowa, które od razu same się narzucają, to jasność myśli, prostota, melodyjność. Brak wszelkich przerostów i popisów technicznych. Technika kompozytorska służy tu jako środek wyrazu. Żaden z młodych kompozytorów nie ulega pokusie, aby pokazywać przede wszystkim to, co umie. Zawsze pokazuje to, co ma do powiedzenia. W tym widać dużą dojrzałość, rozwinięte poczucie odpowiedzialność. Ogromną dojrzałość widzi się również w stronie instrumentalnej utworów. Każda z usłyszanych kompozycji uderza trafnością i swobodą w użyciu instrumentu, nierzadko zaś jest świadectwem prawdziwego kunsztu w tej dziedzinie (np. Toccata fortepianowa Eszpaja czy Suita wiolonczelowa Cyncadze). Strona wykonawcza usłyszanej produkcji stała na najwyższym poziomie. Niektórzy studenci to zupełnie dojrzali, świetni artyści. Wśród nich – gwiazda pierwszej wielkości: wiolonczelista Szafran. Ruza is a village 120 kilometres distant from Moscow. The location of the village is exceptionally beautiful: mixed forest, traversed by narrow paths, on the upper Moscow River, a small bathing area, a landing stage. In the woods, at a few hundred metres, are one-, two- and three-room cottages, wooden or brick, fully furnished, with a piano. In these cottages work Soviet composers. Each a member of the Composers’ Union, and if he has a plan to devote several months to working on his own composition, he is directed to one such artistic colony. He finds everything here that is essential for work: peace, quiet, delightful nature, without all the troubles of everyday life. After work he can relax in the fresh air, play sports like tennis, volleyball, swimming, rowing, skiing in winter, skating, etc.. If he wants, he can spend time in Ruza with his family. Ruza jest to miejscowość odległa o 120 kilometrów od Moskwy. Położenie miejscowości jest wyjątkowo piękne: las mieszany, poprzecinany wąskimi dróżkami, niżej rzeka Moskwa, małe kąpielisko, przystań. W lesie, co paręset metrów domek jedno-, dwu- lub trzypokojowy, drewniany lub murowany, kompletnie urządzony, z fortepianem. W tych domkach pracują kompozytorzy radzieccy. Każdy członek Związku Kompozytorów, jeśli ma zamiar poświęcić kilkumiesięczny okres wyłącznie na pracę nad swym dziełem, skierowywany jest do jednej z podobnych kolonii twórczych. Znajduje tam wszystko, co mu jest niezbędne do pracy: spokój, ciszę, uroczą przyrodę, brak wszelkich kłopotów dnia codziennego. Po pracy może wypocząć w zdrowym powietrzu, używać sportów, jak tenis, siatkówka, pływanie, wiosłowanie, zimą narty, ślizgawka itd. Jeśli chce, może przebywać w Ruzie z rodziną. We go to Ruza with the General Secretary of the Composers’ Union, [Tikhon] Khrennikov. While taking a walk in the grounds, we visit composers at work in their cottages. [Marian] Koval, busy with the instrumentation of a children’s opera [probably the second version of The Wolf and the Seven Kids (1951)], then [Aram] Khachaturian, working on his ballet Spartacus [(1954)]. We ate lunch together with all the residents of the colony. We are welcomed in an atmosphere of uncommon sincerity and comradeship. In conversations with Russian colleagues we have the chance to see that they are all full of enthusiasm for Ruza and the excellent conditions that are found there for their work. From the examples of Ruza we are able to determine with our own eyes how much importance the Soviet authorities attach to art and how admirably they protect the creative endeavours of artists. Do Ruzy jedziemy z sekretarzem generalnym Związku Kompozytorów Chrennikowem. Odbywszy przechadzkę po terenie, odwiedzamy kompozytorów w ich domkach przy pracy. Kowala, zajętego instrumentacją opery dla dzieci, następnie Chaczaturiana, pracującego nad baletem Spartakus. Spożywamy wspólny obiad z wszystkimi mieszkańcami kolonii. Jesteśmy przyjęci w atmosferze niezwykłej serdeczności i koleżeństwa. W rozmowach z kolegami radzieckimi mamy możność przekonać się, że wszyscy oni są pełni entuzjazmu dla Ruzy i znakomitych warunków, jakie tam znajdują dla swej pracy. Na przykładzie Ruzy i my mamy możność stwierdzić naocznie, jak wielką wagę przywiązuje władza radziecka do sztuki i jak wspaniałą opieką otacza twórczy wysiłek artystów.